Clash at Demonhead, known in Japan as Dengeki Big Bang! (電撃ビッグバン!, Dengeki Biggu Ban! ?, Blitz Big Bang! ), is an action-adventure platformer game released by Vic Tokai for the NES on January 27, 1989 in Japan and January 1990 in North America. 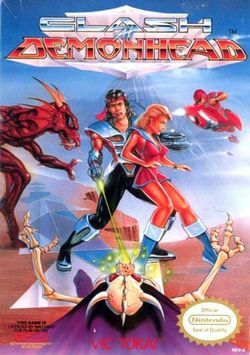 The North American cover was illustrated by Lawrence Fletcher. Clash at Demonhead is an open-ended platformer in the "Metroidvania" style. The player takes control of Billy "Big Bang" Blitz, who is capable of running, jumping, and shooting. He is initially armed with a handgun, though various upgrades can be purchased from a shop, such as the boomerang gun. He later gains the ability to perform various powers by collecting Force, including shrinking, teleportation to previously-visited areas, flight, healing, and invincibility. The game is divided into a number of smaller stages, each representing a point on the over-world map. There are over 40 routes the player can take in the game, and the player must explore the world to progress. The game is non-linear in that the player can choose which direction they go, being allowed to backtrack and visit different stages. Billy "Big Bang" Blitz is a sergeant in S.A.B.R.E. (Special Assault Brigade for Real Emergencies). He is contacted during a vacation at the beach with his girlfriend Mary to save Professor Plum, creator of a Doomsday Bomb capable of destroying the world. Bang soon encounters Tom Guycot, the mastermind behind the abduction, and he learns that the Doomsday Bomb is controlled by six medallions which have been distributed among the seven governors of Demonhead. Billy must attempt to reclaim these medallions, and rescue his allies along the way, in order to save the world from destruction. This page was last edited on 5 June 2017, at 00:19.